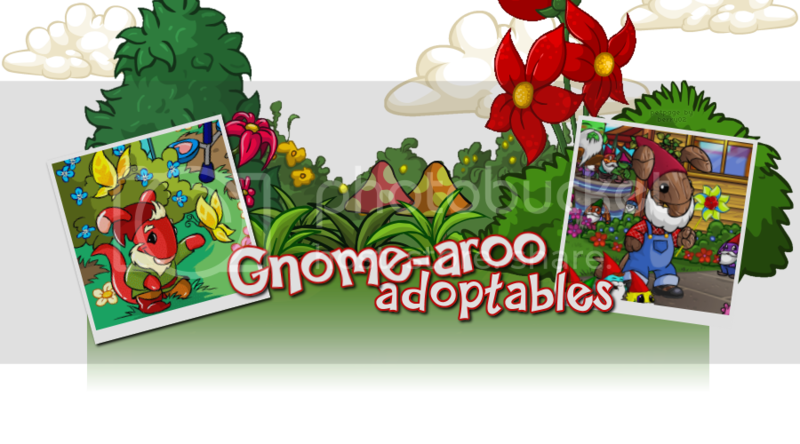 Welcome to Gnome-aroo Adoptables! Gnome-aroo Adoptables got started when I felt like making some sort of adoptables. I was talking to my friend Anna and she came up with the idea of making gnome adoptables, so I decided to put my own little twist on her idea and make blumaroo gnome adoptables! Right now I have every single blumaroo color and when tnt makes more colors I plan on updating the adoptables :) I hope you enjoy the Gnome-aroo's and feel free to link back with one of my buttons! 1) You must keep the link back to this page. 2) You may not enter any of them into the the Beauty Contest or Art Gallery. 3) Please do not edit the Gnome-aroos in any way. This page was made by the talented Anna (Berry02) :* Thank you! All of the adoptables were done by myself.